LAS VEGAS, NV (March 22, 2019) - Last night at The Avalon Hollywood, Prince Ranch Boxing's undefeated welterweight prospect, Blair "The Flair" Cobbs (10-0-1, 6 KOs), picked up the biggest victory of his career winning an eight-round unanimous decision over North Hollywood's Ferdinand Kerobyan (11-1, 9 KOs). With the win, Cobbs captured the vacant Jr. NABF Title on a card that was promoted by Golden Boy Promotions who promotes both fighters. Cobbs, who hails from Las Vegas by way of Philadelphia, came in as an underdog as well as fighting in Kerobyan's hometown of Hollywood, CA. The hostile crowd was silenced from the opening round as Cobbs didn't let the rowdy fans phase him one bit. Cobb's put on a masterclass boxing lesson outclassing Kerobyan from the southpaw stance. "To be honest, I would grade myself a B- after this fight," said Cobbs. "I know people say I did good, but I haven't shown everything I can do yet. I can punch while moving my feet, pivot, jab-step, I do a lot technical stuff and I haven't had a fight that has shown my true potential. I'm happy I got the win while capturing my first regional title. I'm also glad my manager Greg Hannley, and my promoter Golden Boy Promotions, for putting me in such a great position. Kerobyan was cut in the first round from what was ruled a clash of heads. Early on it was the hand speed of Cobbs that proved to be far too much for Kerobyan. Cobbs kept attacking Kerobyan's cut with his jab as Kerobyan struggled to cut off the ring. Cobbs had to show his Philly toughness holding off Kerobyan who surged late in the bout causing his eye to swell. In the end, Cobbs received the biggest win of his career picking up a unanimous decision over a highly touted prospect and winning the first title of his career. The judges scored the bout 79-73, 77-75 and 77-75 all in favor for Blair Cobbs. 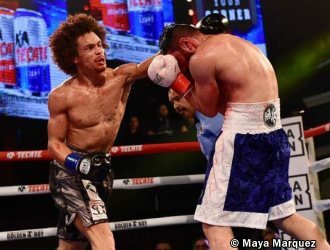 "This is the type of performance we expected and is why we are so eager to work with Blair Cobbs," stated Greg Hannely of Prince Ranch Boxing. "He has the confidence and skill of a true warrior and this is just another step towards the goal of making him a world champ."